Are White Americans Finally Waking Up About Race? You don't need a pollster to tell you that race relations are not especially good at the moment in the United States — all you need is a quick survey of headlines. But a new CBS/New York Times poll confirms it. Fifty-seven percent of Americans believe race relations are bad, versus 37 percent who disagree. (Among Whites, 56 percent think relations are bad; among Blacks, it's 68 percent.) Four-in-10 Americans, among both Black and White respondents, believe things are getting worse. The last time polls showed results this bad was immediately after the Rodney King riots in 1992. Polling is an important barometer for what's going on in the nation, but it's a second-order tool. A poll measures whether people feel race relations are getting worse, not whether race relations are actually getting worse. It's possible that what this poll actually shows is less a material change in race relations than greater awareness among White Americans of racial divisions that were previously invisible to them. This poll offers some strong evidence for this theory. The portion of Black Americans who think race relations are good has reverted to where it was in July 2008 (28 percent now versus 29 percent then), after a number of years of increased optimism. Compare that with the trend in the White population. There has been a nearly 20 percent drop in the number of Whites who think race relations are good. Black Americans didn't need the media to tell them that policing was unequal in their communities, that disproportionate numbers of Blacks were behind bars, or that economic outcomes for Whites and Blacks were widely divergent. They knew it in 2008, and they know it today. White Americans were, until the recent spike in media coverage, largely shielded from these realities. As the pollster Robert Jones has noted, most White people have only other White people in their closest social circle. Most of the change here isn't in the actual substance of race relations. ... Most of the change is in how much more white Americans see those tensions every day. The poll offers even more evidence that this is about a dawning consciousness. For example, as they have in every CBS and CBS/NYT poll since the 1990s, a strong majority of people of both races believe that race relations are good in their own communities. The number of people who think there has been racial progress since the 1960s has remained mostly constant. The Times frames this poll as an "age of Obama" question, using the now rather cliché point that many people thought the president's election would herald a new age of racial harmony; as the poll shows, it has not come. Trying to disaggregate President Obama's impact on perceptions of race relations in the poll from other factors is tough. 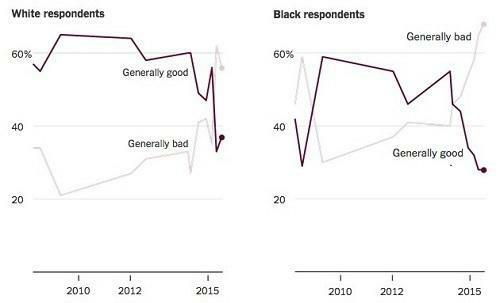 Half of Whites disapprove of how he's handling race, versus 40 percent who approve, while nearly three-quarters of Blacks approve. A quarter of Whites think the Obama administration favors Blacks over Whites; only 2 percent of Blacks agree. An African-American woman in Georgia told The Times she expected this: "I'm not surprised it's gotten worse under President Obama, because he's Black, and so he already had that strike against him once he got into office." But about half of respondents, a clear plurality of both Whites and Blacks, thought that Obama's presidency had had no effect on race relations. That makes a great deal of sense. The highly publicized cases of race tension have been largely outside of Obama's control, and until recently, he has tended to take an extremely muted approach to racial issues. It seems plausible, and maybe likely, that Michael Brown is a bigger factor here than Barack Obama. This theory — that what's driving these bleak impressions about race relations is Whites awakening to realities that were always extant but had been invisible to them — suggests that the results may actually be cause for optimism. Actively grappling with racial tensions is crucial to solving them; ignoring them may obscure the wounds, but it won't heal them. Although more bleakly realistic perceptions of race relations may not lead to improvement, they are a prerequisite to bridging the divide and producing a more positive view of relations between Blacks and Whites.